It is a morning that I will likely remember until the day that I die. The only turkey at mine and my dad’s disposal was a red hot gobbler that was absolutely choking himself. He gobbled at every sound we made, making us feel as if we were the second coming of a Ben Rodgers Lee and Paul Butski duo. The only problem? He was on the opposite bank of Alabama’s Tombigbee River, which was over 300 yards wide at the spot on the map we were standing. But turkeys never cease to amaze me. As we stood on a hundred foot bluff overlooking the river and coursed him as he moved down the river bank, we soon realized he meant business. He was not walking down the bank to get his exercise; he was moving into a position where he could fly across the imposing water mass and find a new girlfriend. We rushed back to a spot 75 yards off the river and let out a few calls to let him know that he better follow because the love train was rolling out. Within five minutes of sitting down, he let out a furious gobble-this time on our side of the river- and it was a matter of moments before I was bearing down on the bead and making the victory dash to an entertaining two-year old gobbler that taught me that when a gobbler wants love, he will exhaust all his options and energy to find it. I have been blessed, or cursed, depending on how you look at it, to hunt in an area that I encounter turkeys across a body of water more often than I do pasture turkeys or any other worrisome type of scenario. The property I call “the home turf” is bordered by a small river for over three miles, and it has numerous creeks and sloughs stemming off its path. Additionally, I hunt other tracts of land that border this same river, so in total I hunt five miles of river front property. Just as a hill country hunter learns to hunt turkeys in that environment by way of circumstance, I too have developed my own strategy on coaxing turkeys across bodies of water, resulting in dozens of turkeys whose spurs now adorn my brag stringer. The first thing someone must understand is that rivers, creeks, sloughs, mountains, or any other type of naturally, or artificially, occurring barrier become a part of a turkeys’ home range. Just as we adapt to crossing the street in a bustling city, turkeys adapt as well. They really have no other choice. While they, like us, want to take the path of least resistance, sometimes the matter at hand calls for them to traverse these barriers in order to get to where they want or need to be. The first mistake I feel people make when hunting turkeys across a body of water is that they try to “crowd the bank” in an attempt to get a shot when the turkey walks down the opposite bank. 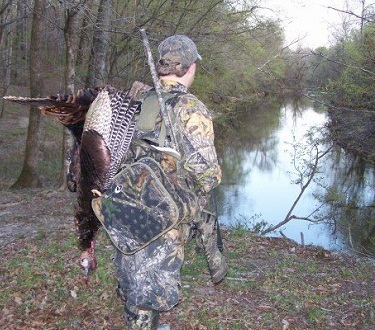 While sometimes this is possible, you must consider that many times the edge of the body of water will be thicker than say ten to twenty yards off the bank, forcing the turkey to walk wide of the bank of the river and more often than not out of range. Additionally, people forget that we are essentially playing a game of chess with a gobbler. When we step into the spring woods, we are taking on the role of the hen, and when we crowd the bank, the gobbler will insist on us-the hen-flying the body of water, not the other way around. I personally like to get about 70-100 yards off the bank of a body of water to prevent the gobbler from “calling my bluff” and hanging up. He knows the hen has gone as far as she wants to go, now it is time for him to make his move and pitch across. I feel this distance gives me some wiggle room to “steer” the gobbler if he lights to my left or right and get into position before he reaches my effective gun range. If the cover, and the turkeys’ distance off the bank will allow, I will ease up to the bank and try to get the gobbler fired up before falling back to a position 70-100 yards off the bank and shut up unless more coaxing is needed. I want to clearly feel his momentum headed my way before I decide to fall back. I find that regardless of whether you are working turkeys across a body of water or in a large, unbroken block of timber, a gobbler cannot resist a hen that is heading the opposite way yelling sweet nothings at him. Just like the girl that plays hard to get, a guy, or gobbler, goes comatose and only has one thing on his mind. And a gobbler with a one track mind is an awfully beautiful thing.